Aunty Genoa Keawe is one of my all-time favorite Hawaiian performers. But she’s so much more than that to me. 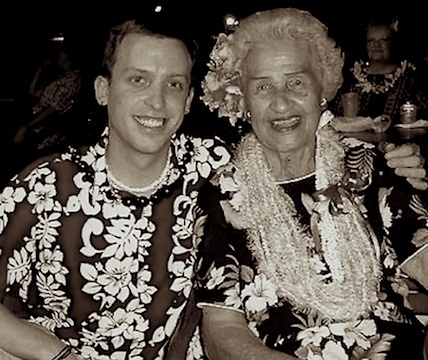 She inspires me every day–making me want to learn more and to help to keep Hawaiian music alive. I keep a photo of the two of us at my desk. I see her smile while I work. This week, on Monday, she would have turned 93 years old! So to honor her birthday–and her amazing legacy–I thought we should open the Weekly “TOP 5″ with a song that’s become one of her signature songs, ʻAlika! By the time I started going to Waikīkī to see Aunty Genoa and her amazing band of musicians sing at their weekly show, she was already in her 80s. But you never would have guessed it–especially when she sang this song. It was like she could hold the notes FOREVER! I miss you, Tūtū. But I’m so happy to have your recordings to listen to! So ʻono! *Please click HERE to visit Aunty Genoa’s website. I love this Molokai song–about the area on the island known as Kalamaʻula. It’s a well-known favorite, covered by many, many artists. A song you’ll recognize immediately if you listen to Hawaiian music. I love the way it’s sung in this recording. Simply. Beautifully. The voice floats like the wind above the land in Kalamaʻula. This recording is very similar to how my own teacher, my hānai father, Pops, sings it in Hālawa Valley. I got all teary-eyed the other day when I listened to it. *Please click HERE to read about an event earlier this year that honored Aunty Vickie and her ‘ohana. The page has a great bio about her and her contribution to Hawaiian music. This song has haunted me (in a good way!) all week. The hui, chorus, with it’s “Eō mai!” echoes over and over in my head. Which illustrates Kawaikapuokalani Hewett’s amazing composition skills. “Eō mai!” (sometimes written as E ō mai!”) means “Answer me.” That should be a stand-out lyric. And he’s crafted the melody to do just that. It echoes. The song is about a flower that blooms in the night. At least that’s what it’s about in a literal sense. I can see a lovely hula being danced to it in my mind’s eye. *Please click HERE to visit Kawaikapuokalani K. Hewett’s website. You guys know how much I love a great 1970′s vibe in song. And this song totally has it! The legendary group from Waimanalo, Country Comfort, recorded some of my favorite tunes. And this week, this song has captured my heart. In my mind, it could be a sister song/brother song to another tune, Delta Dawn. The lyrics are poignant. But it’s the vocals, the jammin’ arrangement, the cool harmonies. It could be remade today and fit in to any radio’s playlist. I dig it. True story. It’s like it reaches way down inside me and pulls at my heart. *Please click HERE to visit Gabby Pahinui an the Waimanalo Kanikapila’s website. What are YOU listening to? Drop me a line and let me know! 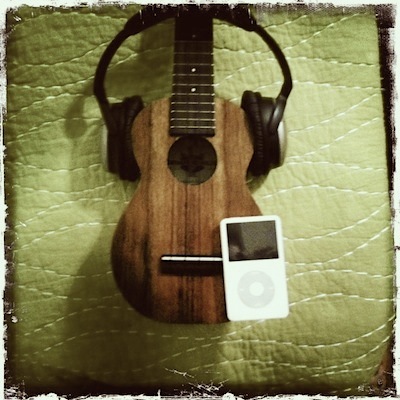 And, as always, a giant MAHALO to Puna and the gang at www.mele.com for being an awesome Hawaiian music resource. You all make the world a better place!